The Eighth Goa festival organised by “Aami Goyenkar”, a cultural organisation, at Dr. Antonio da Silva Technical High School at Dadar in Central Mumbai received an overwhelming response with visitors thronging various stalls to enjoy goan food and purchase Goan handicrafts on Saturday, 10 February 2018. 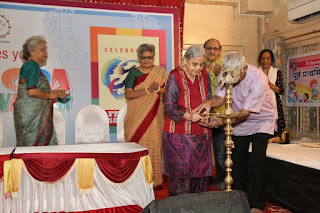 The festival was inaugurated by noted social worker Meghna Wagle. “Aami Goyenkar” President Sanjay Hegade, Sagar Savardekar, Alka kerkar ,Geeta Kapadia and others were present. The festival began with lighting of traditional lamp and recitation of “Ishastavan” (prayer to Lord Ganesh) and “Atharvashirsha” (Ganapati Upanishad) by children of Samajaik Seva Sangh. 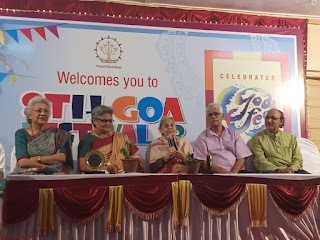 On the occasion, Hegade said that the festival has been organised to promote Goan culture, generate employment and to help artists/artisans to enter into a national market. He expressed satisfaction that the festival has been receiving unprecedented response. In the program, Alka kerkar interacted with Wagle and Kapdia. Later Pinky Khabia guided visitors about scientific cleaning of fruits and vegetables. An elocution contest in Konkani and other events like “Gajali” (chatting), “Udags” (memory) related to Konkani literature, were also organised. Bharati Danait gave guidance about acupressure to the visitors. There are nearly 50 stalls, offering mouth watering goan delicacies, including fish cuisines and culinary flavours, handicrafts, household articles, artistic work etc, which will be open from 10 AM till 10 PM till Sunday. The entry to the festival is free. The contests like healthy child contest, cookery contest, talent hunt, debates, musical and entertainment programs are also being organised as part of the festival.